WARNING: Lots of statistics and graphs below. Proceed at your own risk. Below is a brief summary and analysis of all my runs in 2012. All in all, I ran 77 times for a total of 125.59 miles at an average pace of 8’16” with an average distance of 1.6 miles. Runs were tracked with the Nike+ Running app on my iPhone (GPS), and only outdoor runs were recorded. The majority of my runs were done in the Fall. I was surprised that Sep, Oct, and Nov combined for a whopping 73.81 miles (59% of the year’s runs)! It was definitely my favorite season to run due to the cool 45-65 degree weather and fresh, brisk air. 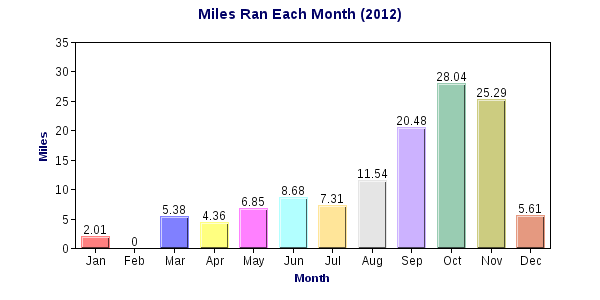 On the other hand, the other 9 months added up to only 51.69 miles (41% of the year’s runs). 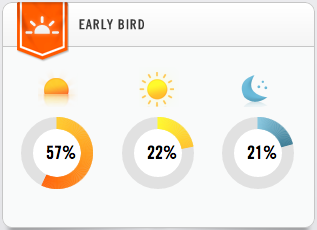 Winter runs were brutal for me; they always felt “un-optimal”. Heavy layers of clothes, icy air blasting through my lungs, uncomfortable freezing of all my extremities. Going for a run was hard enough. The extra challenges of Winter made it much harder. I struggled with runs over a mile for a long time. My body would literally shut down, on cue, after hearing the mile beeper. Until I made one change that ultimately allowed my runs to reach new limits. What was that change? Run for time, not distance. On a whim one day in Aug, I changed the Nike+ run setting to a “time-run”. It didn’t matter how slow or how far I ran. If I had to crawl home, then I would crawl. Just run 20 minutes. It was a major success and the rest of the graph sums up how well that worked out for me. 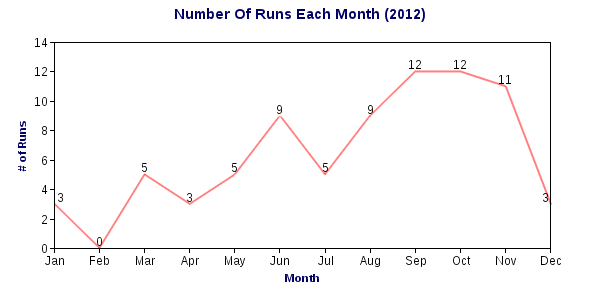 Next, we have the number of runs I participated in each month. Feb was embarrassing; the shock of how hard running was and the cold temperatures traumatized me for a period of time. Otherwise, I’m pleased to see the increasing trend of my attempts to run. Even if they weren’t the best runs, I’d like to think that just making it out on the road was something to be proud of. 90% of success is showing up, right? 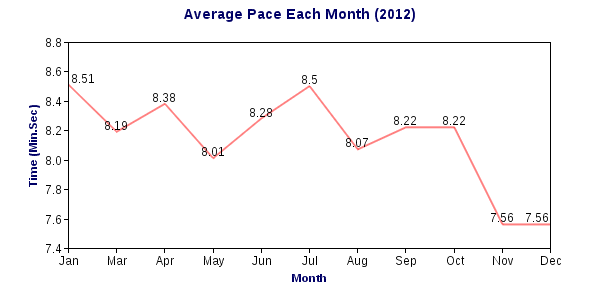 The graph above (not to scale) shows the average pace of my runs each month. In Jan, I averaged 8:51 on my runs. 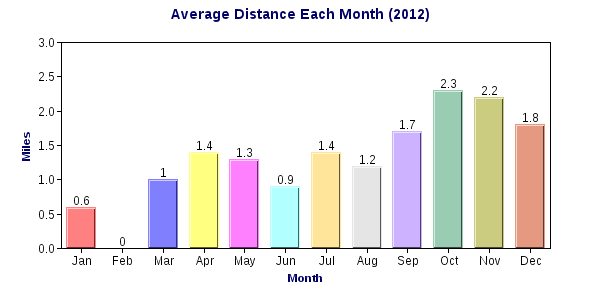 By the end of the year, my average mile was down to 7:56, a difference of almost a minute! The best part? My average pace decreased, even as the length of my runs increased. However, the road there wasn’t smooth. After 6 months of running, I had expected to get better. It didn’t have be a big difference, just some improvement. When I checked my average pace in Jul, I almost quit from frustration. 8 minutes 50 seconds, almost the same pace I started with 6 months earlier. Fortunately, I made some changes and was able to see some improvement. Running in the morning was my preferred choice. It felt great to crawl out of bed, throw on my shoes, and make a statement on the day. The neighborhoods and streets were quiet, leaving just the sounds of my steps and rhythmic breathing to keep me company. Night runs were appealing in the hot Summer months, while afternoon runs were favored in the Winter and Spring to maximize the warmth of the sun. Finally, my personal records of the year. My farthest (and longest) run was 3.42 miles at a pace of 8’46” in 30:01. My fastest 5k was finished in 24:49 at a pace of 7’56”. And my fastest mile was completed on a high school track against my brother, where I ran it in 6:29. In summary, recording my runs were invaluable in completing my goal to run 100 miles. It gave me a way to track my progress, as well as provide insight on what worked and didn’t work on my runs. As I settle more into the running groove, I plan to focus less on distance and time to incorporate different exercises such as fartleks, tempo runs, and intervals into my training. I don’t know what 2013 holds for me, but I’m excited to face the challenges on the road.